It is the month of the long shadows and we are usually in the other hemisphere, missing what can be the best month in the Highlands - short crystalline blue days, long dark snug nights brilliant with galaxial dazzle, and neither bush fires nor snakes to haunt the well-being. This year is persistently and unusually warm and still. No frosts yet. The weather changes worry me if I let them, but for now these days are near bliss. For the solstice, K lit candles in the bedroom which burned all night. There's a clearing in the big gardens defined by a circular stone wall. Plans were to have a central fire pit, and on mid-winters evening light a big fire and take our clothes off and dance to flying sparks under the stars. Meanwhile, the candles in the night will do. If this all sounds 60s hippie, that's fine by me. This morning, Sunday of the winter solstice weekend, the sun rose around seven, lifting itself up over the north east ridge of distant gums and, sitting low, looked right into the bedroom and onto the pillows with sleepy heads still. 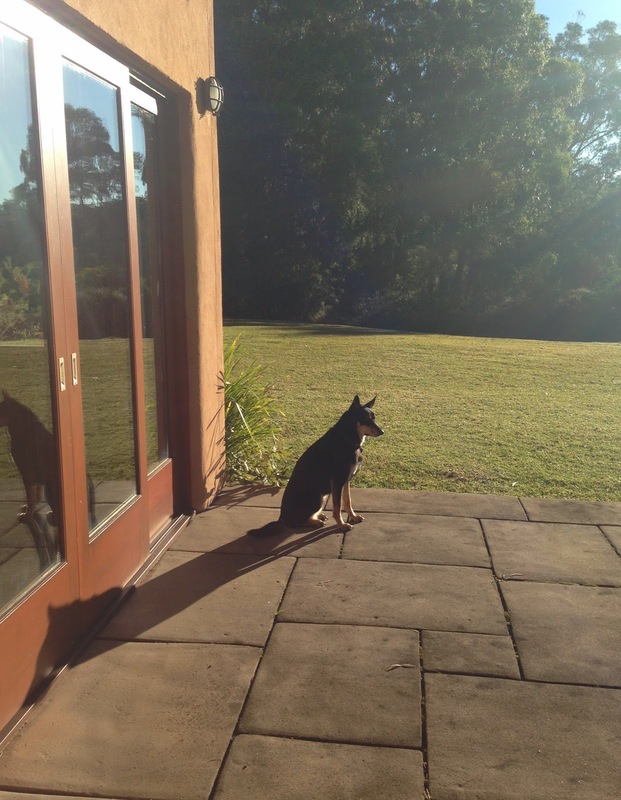 With the verandah doors just open a dog width, cool morning air slipped in to glance a cheek. Unlike other climes, flowering goes on all year. Banksias are in full swing, and the Grivillea 'Forest Rambler' which I've hedged at the bedroom window to entice the honey eaters is spotting already, the early sun fleshing out it shell pink beauty. I like the sound of your June, the "galaxial dazzle," such a marvelous phrase. That post just made it. Today is overcast, grey, windy and cold. Noble beasts cast the longest shadows. Our Midsummer was the loveliest I can remember. Greyer here too today.